Veteran cruisers will tell you that an overnight passage is just as tiring as say a 3 day passage. You spend a day getting ready, you leave and your sleep schedule is out of whack, your feel for a moving boat is out of whack, and your eating style is disrupted. Then you arrive, same anxiety with one’s landfall in a day as one landfall 3 or more days down the line, you find a place to anchor and you spend a day resting and getting the boat back to a comfortable livable condition. You clean up and put things away. Wash the boat if you can, wash the jacklines, the foul weather gear, the safety harnesses. Fold and cover the sails, coil and store the sheets. We wipe down the cabin floor as no matter how we try, salt from the feet seems to work it’s way to the cabin sole. So we made it to Snug Harbor where we dropped the hook in 40′ of water. A long way down. On the way across we started out motoring the first day as the winds were light out of the NE. About 5 hours outside of San Bernardo’s, Colombia we felt we had enough breeze to put up some sails. We shut down the engine and heaven descended upon us. The quiet, the movement for all intents and purposes of a boat mimicking life. The sails are doing their job and pulling approximately 40,000 lbs across a 150 nm stretch of water. We were sailing about 4 kits but we didn’t care. The water was relatively flat like a lake and we were going towards our destination at a comfortable speed with an easy motion. I put out two fishing lines. It was time to feed the Mahi-Mahi. For the last 1,000 nm’s they’ve been attacking and taking my plastic lures. I was hoping on this trip to catch one at the theft and haul their rainbow colored bodies aboard to feed the ships crew for a few days. As the day wore on and we continued to pull away from the South American Continent the breeze slowly increased to a pleasant 10-15 kits. So too did the boat and we were now in the Indianapolis speed zone of 5-6 knots, the speed of a good runner. Once we reached the 5 kt range we heard a zing of the line on our reel. I race as fast as I can on a moving boat to grab the rod in hopes of landing this one. The Mahi makes a couple leaps out of the water trying to shake the hook free and then peels off more line, and I’m excited. W/’s been cranking in the other line; although two fish landed would be great we have enough difficulty landing one fish at a time. She’s a large one! I let the line run out and then just about the time W/ has the other lure cranked in my line goes slack. DAMN! There goes Dinner, Lunch, Dinner, Lunch, Dinner, etc. She would have fed us for a few days. So after a few of my selected choice words issued towards the kingdom of fish I put the one line back out and crawled below to grab another lure. I’ve now given the fish about half a dozen of the plastic lures to feed on. I wonder if I have heavy enough line (80 lb test) and I’m wondering if I should replace it a little more often. RIght now the line has been on the reels for about 3 years. But this is not the place to do that so I file that info in my dusty cranium and dig out another lure. Rig it and release it. We’re cruising along now about 6 kits and the lures are doing their wonderful dance to the surface and then they dive a foot or so beneath it trailing a stream of bubbles a couple of meters long. We both go back to our tasks, reading, day dreaming, and just watching in awe the deep royal blue of open water. We’re settled in for the afternoon. Zing! Zing! One reel runs out quickly and then stops, 2 seconds the other line takes off. Another fish. Again the same dance, I race and try to make sure we don’t loose this one. The line is peeling out faster then ever and I’m afraid it will get to the end and then snap. Slowly I increase the drag on the line as the Mahi endeavors to steal more and more of it. Feeling like I’ve been at this 1/2 an hour but knowing that it’s been most likely 5 minutes, I have him stabilized with about 10 wraps of line left on the reel. Since W/ now has the other line pulled in she’s at the helm. As we’re traveling too fast and the fish is fighting for his life (Yeah, it looked like a Bull Mahi – Mahi to me when it jumped) she points the boat into the wind a bit to slow it down while I begin to reel the beast in. We spend close to twenty minutes more, luffing the boat, falling off, luffing, falling off and all the while I’m inching the line in and bringing the succulent dinner to the boat. He makes a couple of more runs and peels out some line but I’m slowly winning! Or so I think. As we finally get him closer to the boat I can see his figure down in the water and W/ has the gaff ready. She luffs the boat up a bit more so I can reel some more line in and he takes off across the stern dragging the line to the other side of the boat. I carefully hand the pole across the back of the boat to myself not wanting to get the line tangled in the windvane or rubbing across the backstay. He’s now swimming beside the boat about 40 feet away and I have W/ turn the boat to bring him more astern, he obviously hears me and shoots off towards the bow and under the boat. I feel the line drag across the bottom of the boat and fear the worse. Another fight lost with a fish, another lure gone and one tired puppy; me. But; he’s still there and pops up by the stern and I still feel him on the line. Hurray! I begin to keep the line taught and he makes another mighty stab towards freedom. The line goes slack, I scream, and we begin to sail towards Panama again. What have I to show for all this effort; 5 blisters on two hands and a long story to tell. I’m so tired the rest of the day we don’t trail any more lures. With the blisters on my hands I don’t think I could actually reel the fish in and with as much as Mahi’s fight and no fighting chair I don’t want to risk losing the pole, and I don’t want to risk losing W/ over the side. We have a delightful sail till about midnight when the breeze starts to abate and by 3 am we’re again using the Iron Genny (engine) and motoring towards Panama. As the sun rises we begin to search for land. We’re scanning the waters edge intently when I see fish leaping out of the water. Yesterdays loss is becoming a distant memory and with a new day comes new visions of capture. 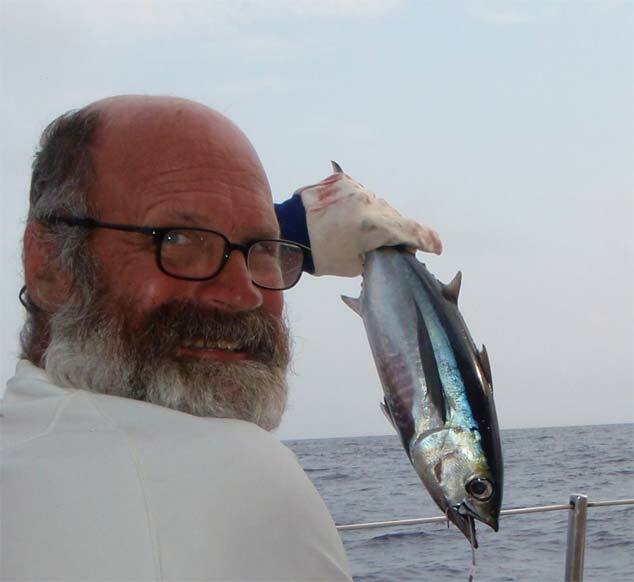 More fish jump (Black fin Tuna) and so I trail just one line. Less then an hour later we hear a zing of the reel and I go to crank in what ever we have. I don’t know what this one is, I suspect it was another Mahi- as it peels out line quite fast and then boom it too was gone. I may be stupid but I don’t like giving up. I dig out another lure (I’m going to need to get some more) and sent it back into the deep blue. We spot Land and yell the required mantra “Land – Ho”, we’re motoring, we’re fishing – maybe best to say we’re feeding the fish plastic lures. and we’re hopeful. Hopeful that we’ll soon be cleaning a nice catch and then look forward to rest. Zing! Again we go through the land a fish dance. Since we’re motoring it is easier for W/ to slow down, motor forward, and turn the boat. We don’t need to be concerned about the sails and gybing or luffing and popping as the wind fills them in. I slowly make progress and we bring the fish to the boat. W/ has the gaff ready but as I see it’s a Black Fin Tuna and only a few pounds so he’s close enough to the boat I swing him aboard. W/’s ready with the Rum (we kill the fish with kindness – He dies in a drunken bliss) and we pour it directly onto his gills. I filet him and toss the carcass back to Neptune for further consumption. Nothing goes to waste in the ocean. By noonish we’ve made landfall and are motoring towards Snug Harbor hoping that the name fits. We find a calm place to anchor, drop the hook, take care of some projects on the boat and immediately begin our R n R. We’ll clear in when we get to Porviner in a couple of days. For now the stars are calling and the cow is ready to jump over the moon.